PIPE PIER® supports electrical equipment and conduit on roofs and under false floors. Why Use PIPE PIER® For Your Electrical Conduit Support? The PIPE PIER® system allows for sensitive electrical wiring to be raised above commercial and industrial roofs and out of the standing water, snow and ice that can damage electrical components and shorten their lifespan and lead to costly fixes and reinstallations. 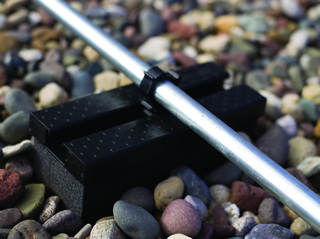 PIPE PIER® are light-weight, easy to install and have a longer life span than the wood blocks that have been used on many roof installations for elevating electrical conduit. PIPE PIER® can be used for improved support for electrical systems on commercial roofs.